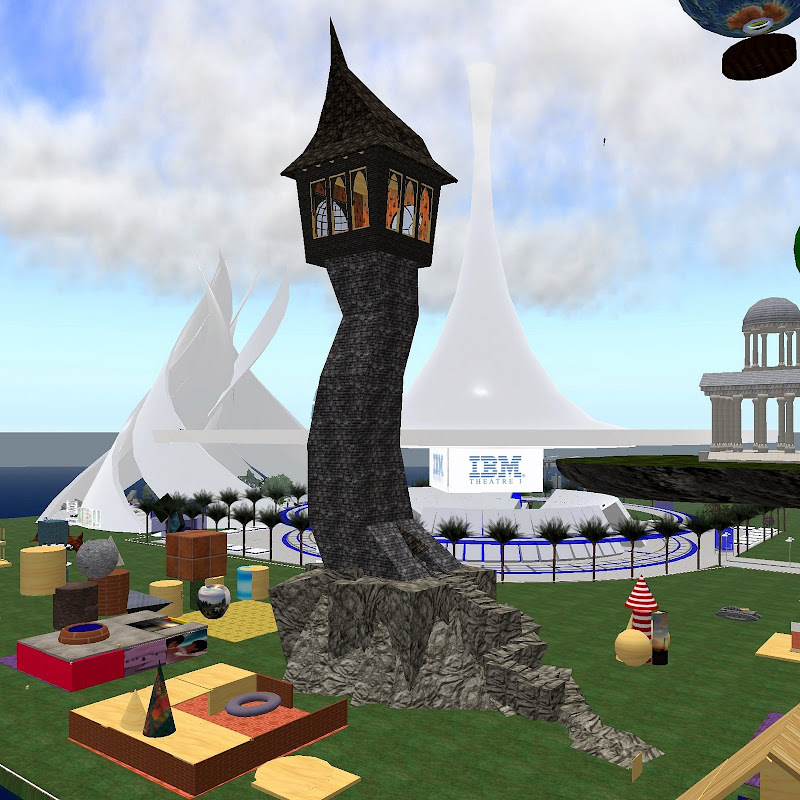 I love roaming the sandboxes, watching people's imaginations materialize into three-dimensional objects and places that can be shared with others. Yesterday, I discovered an intriguing work-in-progress that holds much promise for virtual world newbies. 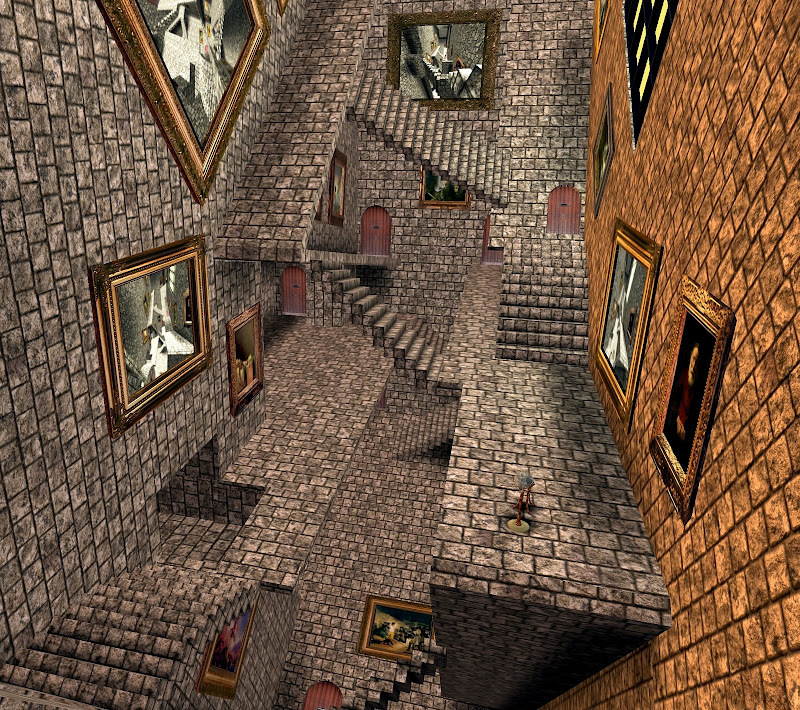 "I grew up with books of Escher all around, as my brother was into him. 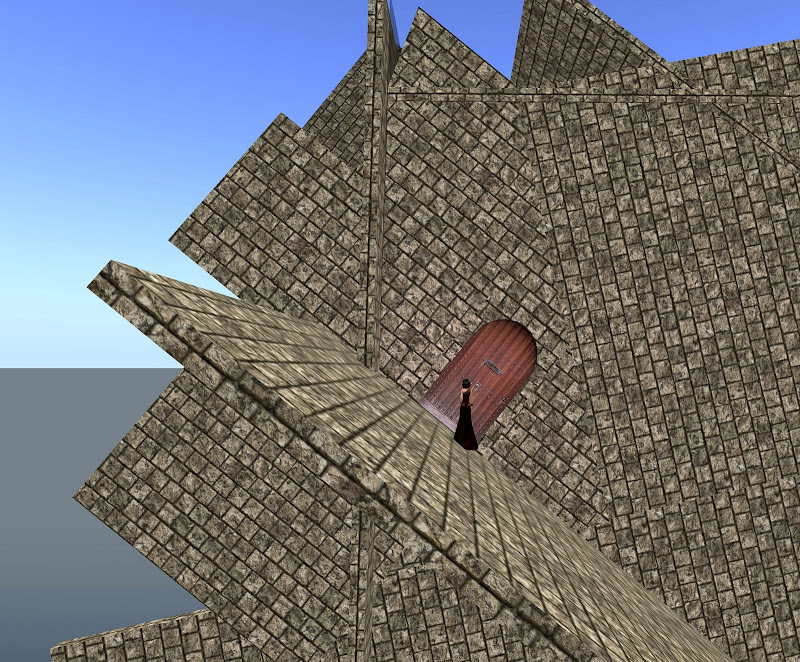 The first picture I drew with shading was an Escher-like image of a well, so when I thought of what kind of space I could introduce to Second Life® to make people want to explore in different ways, the first thing I thought of was Escher." So said Second Life resident and 3D artist Colin Fizgig who's been busy at the IBM sandbox (teleport directly from here), building the Hall of Wonders, a highly unusual edifice that will later be used as an IBM learning site. Perspective is at play here, as Colin is introducing unusual vanishing points and forcing us to reconsider what is "up," and what is "down." "The effect I'm going for is a seamless transition from a narrow tower on a cliff, to going through the front door and being in a small room... then going into a huge hall and going down instead of up. Sort of warp their idea of space," explained Colin when I spoke with him this morning. The exterior of the building is angular, with numerous front doors. 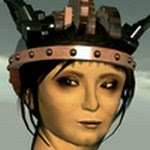 "It is designed to make people uncomfortable in normal WASD movement, so they learn to do camming (use their camera), teleports, and just explore by clicking," added Colin. Visitors to the Hall of Wonders will be gifted with a HUD that will hint at the building's story lines and what happens to the characters there, including the inventor, the guard and his girlfriend. 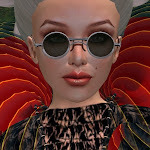 I'll post the slurl once the Hall of Wonders has been completed and installed at its destination point.